Fifty years after the moon landing, renowned speaker and Grammy-winning composer Eric Whitacre presents Deep Field, a powerful new piece of music inspired by the Hubble Space Telescope, the world’s most famous space observatory, and its greatest discovery, the iconic Deep Field image. The new film illuminates the score by combining Hubble’s stunning imagery with bespoke animations to create an immersive, unforgettable journey from planet Earth to the furthest edges of our universe. 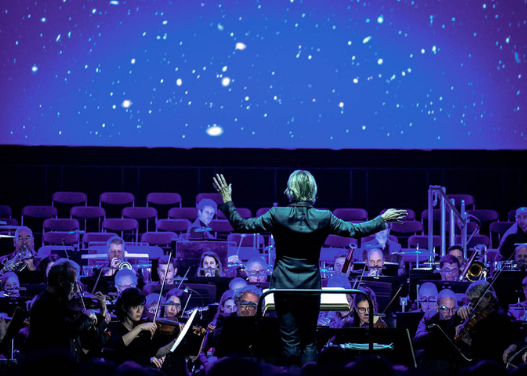 Whitacre is joined by NASA astronomers, scientists and astrophysicists to delve into space exploration as not only a scientific venture, but an artistic and cultural one as well. Following the film screening and discussion, Whitacre and panelists will host a meet and greet and CD signing. VIP attendees are then welcome to a cocktail hour. The New York premiere of Deep Field will take place on the same weekend as Bethel Woods' Lunar Weekend, where there will be immersive family-friendly activities, from a star-gazing sleepover, to rocket launching and an inflatable planetarium. Deep Field is part of the Vibrations series. Vibrations launches in 2019 with eight unforgettable events bringing together change-makers, artists, and influencers to open conversations, inspire thinking and awaken purpose. Emphasizing the value of the arts and civic engagement, Vibrations brings the legacy of the past into conversation with the movements of today. Special 50th anniversary events and activities are supported in part by donors to Bethel Woods Center for the Arts and by a grant awarded to Bethel Woods by Empire State Development and New York State's Division of Tourism/I LOVE NY under Governor Andrew Cuomo’s Regional Economic Development Council Initiative.